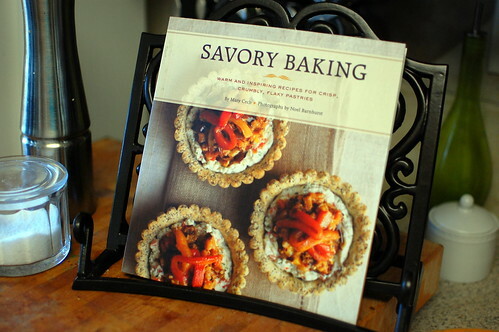 In addition to Rick Bayless's cookbook, Santa also brought me a book called Savory Baking. NPR named it one of the top cookbook's of the year, so I couldn't wait to break it in. It is chock full of intriguing recipes that I'm so excited to try. Some of the ones I'm especially looking forward to: smoked-salmon crepe torte, hazelnut waffles, peppered pear and goat cheese scones, baked pomodoro dumplings on olive salad, onion and sherry cream turnovers... seriously I want to make them all. I actually kept it pretty simple with my first recipe, mostly because I already had everything I needed to make this bread. It couldn't have been any easier to put together, and the resulting bread was delicious! 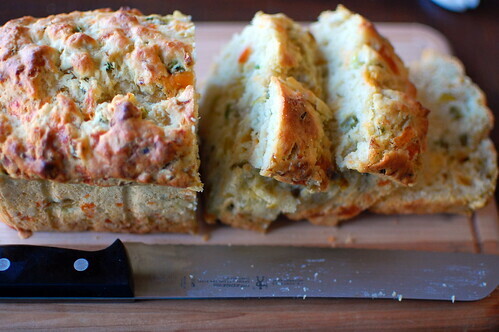 The bread actually reminded me a little bit of Ina's Jalapeno Cheddar Cornbread, but a little turned up. It houses 3 different peppers: fresh jalapenos, green chiles, and red bell peppers. 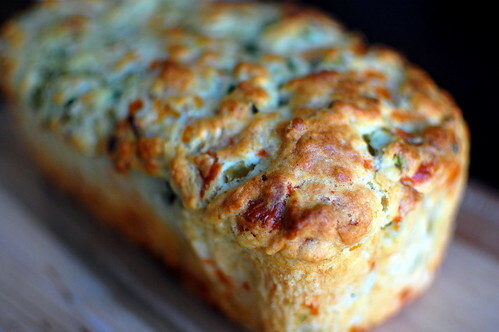 Moist, flavorful, and a little spicy, we went through this loaf before I could make the gratin sandwiches that were actually part of the original recipe! I will say that it makes great cheese toast though! Preheat the oven to 375, and grease or spray an 8x3 inch loaf pan. Sift together the flour, salt, pepper, sugar, and baking powder in a medium bowl. Add the cheese and gently toss and stir until it is evenly distributed throughout the mixture. Whisk the milk, oil, egg, green chiles, jalapeno, and red bell pepper in another bowl. Make a well in the center of the flour and cheese mixture, and pour the milk mixture in the center. Briefily blend with a spatula, only until the dry ingredients are just incorporated. Pour the batter into the prepared pan, and place in the oven. Bake until the top is golden-brown, and springs back when touched in the center, about 45-50 minutes. Cool on a rack for 10 minutes, then remove the bread from the pan and cool completely. The look of this bread alone has me sold; what wonderful colour and the texture looks perfect. I look forward to trying it out soon, the layering of the different pepper flavours sounds interesting. Oh, what an intriguing cookbook! How fun! I'm going to have to check that one out. The bread looks amazing! Looks great! I love your cookbook holder - so cute! That bread sounds and looks amazing. You just introduced another cookbook to my wish list! I love savory baking. I can't wait to see the other goodies that you make from this book. I love savory breads! Can't wait to try this one! Wow that looks wonderful, thanks! I just started cooking from that book too and I love it!